In Italy, we have the sea. Of course, you’ll hear it described in many of the same ways here as it’s described elsewhere, but there’s just something different about our relationship with the sea. 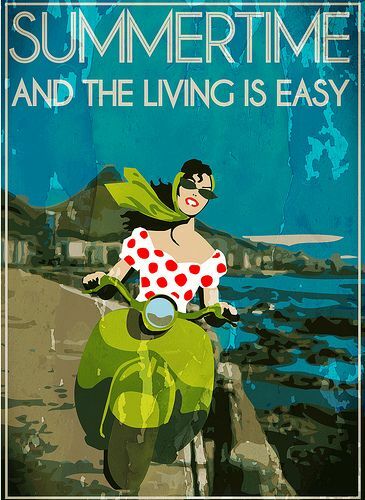 In late summer, Italians all over the country take off several weeks from work and most spend that vacation time in a quaint seaside location. I, myself, have vivid memories of playing with my sister over holiday on the pebbly sands of the Adriatic. To this day, the slightest smell of salt air takes me back to a place of childhood! What makes the Italian seaside so special? It’s important to remember that Italy is a peninsula. We’re surrounded by (beautiful!) water on every side, and many heavily populated parts of the country are in fact islands. The sea is everywhere – it’s simply a part of Italian life – which is why we’ve built such a rich cultural tradition around its presence. Seaside traditions vary from town to town, coast to coast. The way people eat, celebrate, and relax along the shores of the Adriatic and Tyrrhenian Sea is representative of the Mediterranean lifestyle, to be sure. Despite small differences from town to town, seaside culture in Italy is generally very slow-paced, very food-and-wine-centric, and very natural by design. One of the best things about visiting the beach in Italy is that we have many different kinds of sand! Some of our beaches, of course, have powdery white sand. Others are covered in coarse grains – sometimes black or golden in color – or even small, smooth pebbles. Almost uniformly, the water in Italy will be a spectacular blue-green color as far as the eye can see, particularly on the Mediterranean and Adriatic coasts. In warm weather, Italy’s seaside towns come alive with visitors and locals alike; shops are selling trinkets, vacationers are throwing down beach towels, and seaside cafes are serving delicious glasses of Italian wine. One of the absolute best things about Italy’s relationship with the sea is our commitment to its bounty. Italians have a way with seafood. In summertime, grilled seafood dishes with scallops, fish, or prawns abound, usually complimented by vegetables. Throughout the year you’ll find menus packed with seafood like mussels and clams in richer preparations. Seafood in Italy is always fresh, always delicate, and always best accompanied by a complimentary Italian white wine. Modern development has left many of Italy’s seaside towns delightfully undisturbed. It’s still entirely possible to disappear into a village on the sea for weeks at a time to enjoy long, cobblestoned strolls and cap off every evening sharing a bottle of Merlot or Rose, depending on the season, in the town piazza with townsfolk and tourists alike. There’s something magical about our connection to the water here in Italy, and you can feel it in the air as soon as you hear the sound of the water and the call of the gulls. 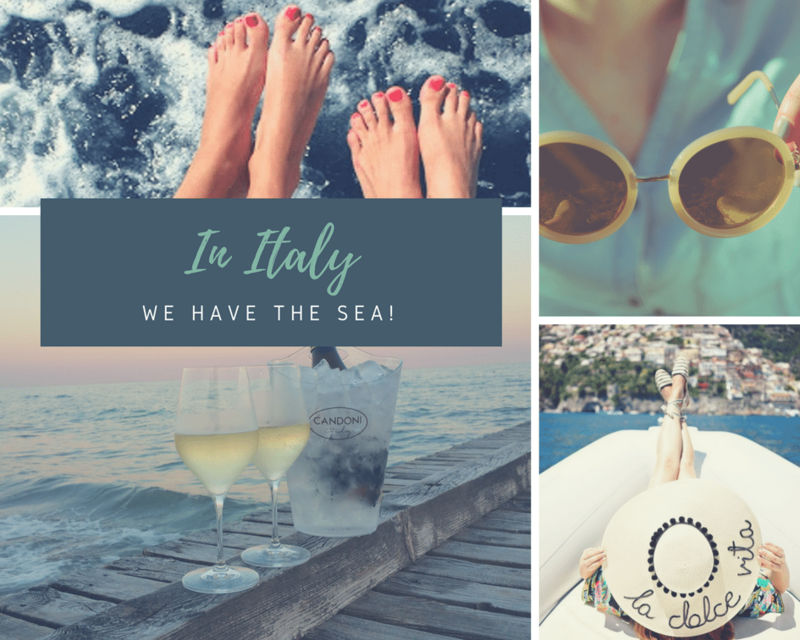 Where in Italy is best for enjoying the sea? The Amalfi Coast, of course, is as picturesque as it gets, and Capri is quite beautiful, as is Portofino. Growing up in The Veneto region of Italy, we’re quite partial to the familiar, relaxed vibes of seaside spots in our area like the Venice Lido or our favorite, Caorle. Caorle is where we always spent childhood seaside vacations, and still do! It is like a little Venice, with historical fishing villages and colorful painted houses, and was actually a favorite spot of Earnest Hemingway’s. He loved the Caorle Lagoon and its unspoiled countryside so much that he was inspired to set a book there, Across the River and Into the Trees. We can’t wait for our next seaside excursion. Whether for a day or a month, there’s simply something transformative about time near the sea in Italy.